1. Acer griseum (Paper Bark Maple) – gorgeous peeling bronze bark glows a warm cinnamon-red in winter and has rich scarlet leaves in autumn. It’s a great specimen for a small garden as it is slow growing and has a very attractive habit. 2. Acer palmatum ‘Sangu Kaku’ (Coral Bark Maple) – a small tree with bright green leaves and attractive coral-red young stems – it is one of the most valuable and dramatic for winter effect. 3. 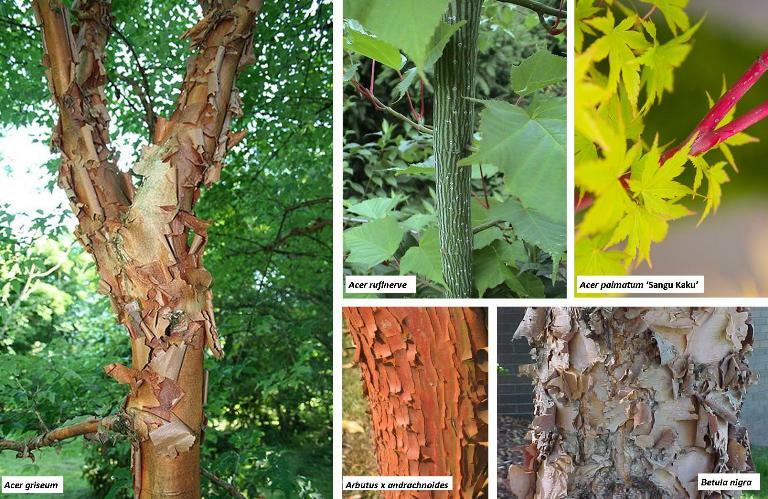 Acer rufinerve – medium sized deciduous tree with bluish young stems that change with age to reveal a ‘snake-bark’ patterning. It has bright red and yellow autumnal foliage. 4. Arbutus x andrachnoides (Strawberry Tree) – small hybrid tree with beautiful cinnamon-red branches and white flowers in late autumn and early winter. Is best suited for milder areas or warm sheltered sites. 5. 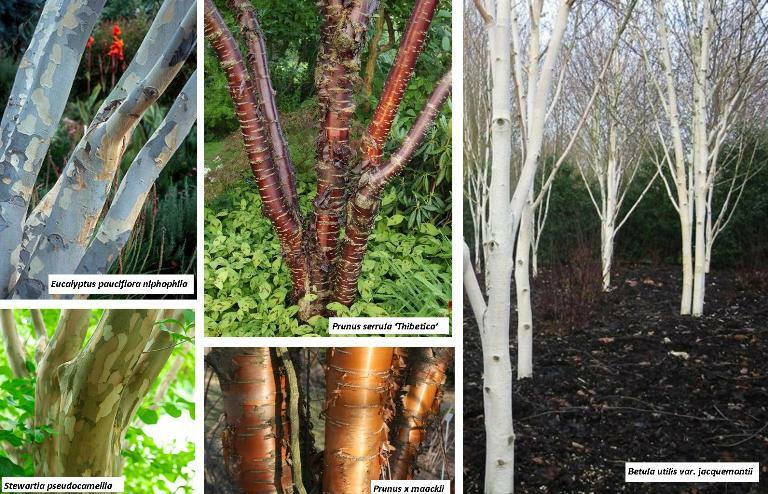 Betula Nigra (Red Birch/River Birch) – beautiful fast-growing medium sized tree with gorgeous shaggy pinkish-orange bark that becomes brown and ridged on old trees. It is one of the finest trees to plant on damp ground. 6. Betula utilis var. jacquemontii (Himalayan Birch) – medium size tree with dazzlingly white bark that catches the light, especially in the winter sun. Looks great when planted in small groups and the light foliage allows interesting underplanting. 7. Eucalyptus pauciflora subsp. niphophila (Snow Gum) – beautiful small tree with large leathery grey-green leaves. The trunk is a patchwork of grey, green and cream and has been likened to the skin of a python. Best suited for mild areas or a sheltered sunny site. 8. Prunus serrula ‘Thibetica’ (Tibetan Cherry) – small vigorous tree with gorgeous shining mahogany-red richly peeling bark, a great substitute for Acer griseum if you can’t wait for it to grow. Small white flowers are produced in late spring. 9. Prunus x maackii (Manchurian Cherry) – small deciduous tree with amber-coloured flaking bark and a narrow crown. Small white single flowers are borne in mid-spring. 10. Stewartia pseudocamellia(Janese Stewartia) – small to medium-sized tree with attractive dark red peeling bark. It bears white flowers and the leaves turn yellow and red in autumn.